For some reason it seems that the 1204 didn't really capture peoples imagination like the 1201 did. 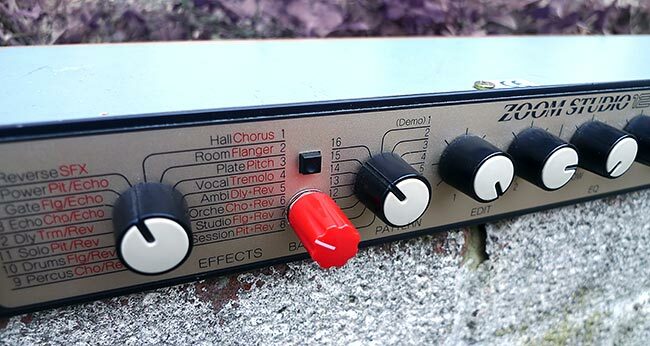 If you wanted a decent budget reverb in the mid 90's, you probably bought a cheap Lexicon, or even the cheaper Zoom 1202. If you wanted some stranger budget multi effects you bought a 1201. We only have one mod on the 1204, and thats the red reclocking knob to the right of the effect selection knob. The reclocking knob sets the system clock speed of the RAM and the analogue to digital converters. This means it will extend the reverb and delay times to a degree way outside of what would normally be possible. Reverbs can be altered from short metallic ambiances to massive washes of granular glacial sound just by turning the knob. Delay times and pitch shifting effects are now infinitely variable over a massive range, and even the panning effect can be the source of some wild clock based pitching. Any effect that ever samples the input signal into the RAM in order to process it, can be reclocked. If you want your ZOOM 1204 modded get in touch using the CONTACT form.